gave a workshop on ECRIF. at the TESOL Conference in Chile. Amalia learned about ECRIF when she took the TESOL Certificate Course at Centro Espiral Mana. ECRIF is a framework for seeing learning, lesson planning and on-going assessment. Below are some pictures of the conference in Iquique last month. I explained about ECRIF as I told you before and I also said I learned about it at Centro Espiral Maná in Costa Rica, which was part of a scholarship I won with TESOL. 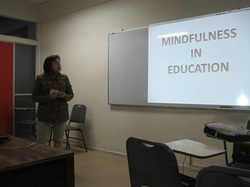 Monica, a professor at the Pontificia Universidad Catolica de Valparaiso in Chile, took our course on workshop design in April 2013 and gave her first workshop at the national TESOL conference in Chile this August. Congratulations Monica! I would need lots of pages to explain and tell everything I learnt at CEM not only as a person but also as a professional. As a person I learnt to share the good and bad times, to listen to other people’s problems, to empathize and sympathize, to be less violent when communicating my ideas or messages, to understand that the material or things don’t bring happiness but the good relationships with other human beings does bring happiness. As a professional, the experience in EL INVU improved and enriched my expertise on how to prepare Development Workshops, how to organize my workshops, and the most important: to try to do everything as a professional and in the best way we can so our colleagues can really benefit from what we prepare and present. After my experience in Costa Rica, I learnt that we are all a community, a family, a team that should work together as a team to get all our goals. In a nut shell, it has influenced a lot on my personal and professional life and it’s always present when I am front of other colleagues or students. I must thank not only Mary, but also the great people who work with her, the people who cook that delicious food, the people who clean the institute and of course the great human beings who work there teaching and sharing their experiences. I took at CEM two courses, the SIT TESOL Certificate and the Skills and Principles in Language Teacher Training. To be honest, having the opportunity to do so was the best thing that happened to my teaching skills and me. Not only they made me a better teacher and teacher trainer, but also a better person. I suppose that it has to do with “you teach what you are”. So first you have to do is look inside of you. It is amazing what you can learn in one really intensive month. Obviously, you learn more because you live the experience; you are immersed in a world of teaching and learning. All I can say is… now that I know what it is like… I want more. 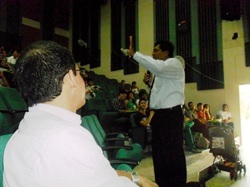 In the picture, I am at the National Conference of Teacher of English here in Costa Rica. I gave two workshops. LUZ from a binational center in Costa Rica.